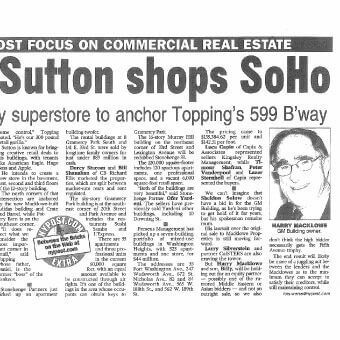 Mr. Sutton Shops SoHo, by Lois Weiss. The SoHo International Arts Building at the "Gateway to SoHo" will soon see some restoring and signage. Retail maestro Jeff Sutton signed a 49-year lease venture with owner David Topping for the building's lower levels, 40,000 feet of 599 Broadway at the southwest corner of Houston Street. The building is known for the battle over its now-landmarked Forest Myers artwork on its exterior. Sources say the deal is valued at nearly $500 million but Topping would say only that a "few hundred million sounds right." Sutton is known for bringing creative retail deals to his buildings, with tenants like American Eagle, Hugo Boss and Apple. He intends to create a new store in the basement, first, second and third floors of the 12-story building. The north corners of that intersection are anchored by the new Macklowe-built Adidas building and Crate and Barrel, while Pottery Barn is on the Southeast corner. "It does reflect what we consider the most important corner in retail," said Topping whose father, Daniel, is the former "boss" of the Yankees. Stonehenge Partners just picked up an apartment building twofer. The rental buildings at 8 Gramercy Park South and 141 E. 33rd St. were sold by longtime family owners for just under $83 million in cash. Darcy Stacom and Bill Shanahan of CB Richard Ellis marketed the properties, which are split between market-rate rents and rent regulated. The six-story Gramercy Park building is at the southeast corner of 20th Street and Park Avenue and includes the res taurants Sushi Samba and L'Express. There are 55 apartments and three pro fessional units in the current 60,000 square feet, with an equal amount available to be constructed through air rights. It's one of the buildings in the area whose occupants can obtain keys to Gramercy Park. The 16-story Murray Hill building on the northeast corner of 33rd Street and Lexington Avenue will be redubbed Stonehenge 33. The 120,000 square-footer includes 120 spacious apartments, one professional space, and a vacant 6,000 square-foot retail space. "Both of the buildings are very beautiful," said Stonehenge Partner Ofer Yardeni. The sellers have previously sold Yardeni other buildings, including 10 Downing St.
Perseus Management has picked up a seven-building portfolio of mixed-use buildings in Washington Heights, with 323 apartments and one store, for $44 million. The addresses are 35 Fort Washington Ave., 247 Wadsworth Ave., 672 St. Nicholas Ave., 82 and 84 Wadsworth Ave., 565 W. 188th St., and 562 W. 189th St. The pricing came to $135,384.62 per unit and $142.51 per foot. Luca Capin of Capin & Associates represented sellers Kingsley Realty Management, while Timour Shafran, Peter Vanderpool and Lazer Sternhell of Capin represented the buyers. We can't imagine that Sheldon Solow doesn't have a bid in for the GM Building, as he's been trying to get hold of it for years, but his spokesman remains mum. His lawsuit over the original sale to Macklowe Properties is still moving forward. Larry Silverstein and partner CalSTERS are also craving the tower. But Harry Macklowe and son, Billy, will be holding out for an equity partner - possibly one of the rumored Middle Eastern or Asian bidders - and not an outright sale, so we also don't think the high bidder necessarily gets the Fifth Avenue trophy. The end result will likely be more of a juggling act between the lenders and the Macklowes as to the minimum they can accept to satisfy their creditors, while still maintaining control.